Exercise Tartan Musket was a Battlefield Study that took place in Germany in 1992. 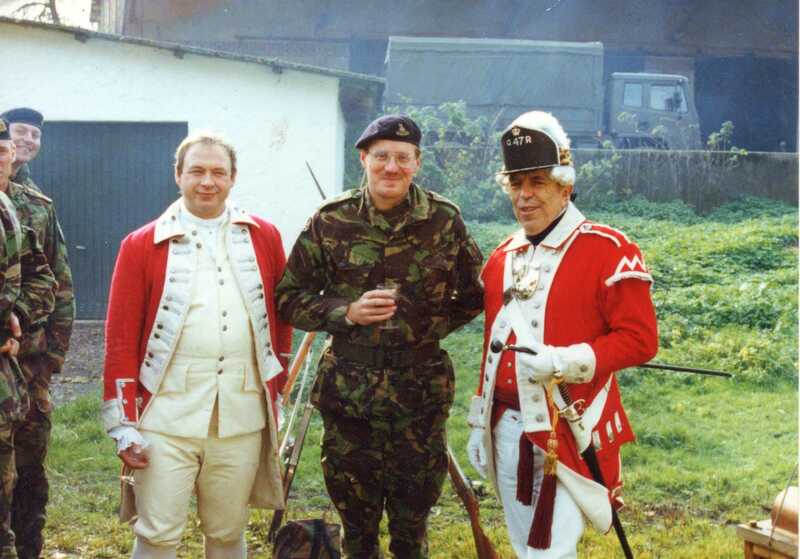 It originated with the intention of the Commanding officer fo 40 Field Regiment Royal Artillery to provide an opportunity for one of his battery commanders to demonstrate his command and leadership in the shadow of Options for change. It was a battlefield tour than a staff ride. 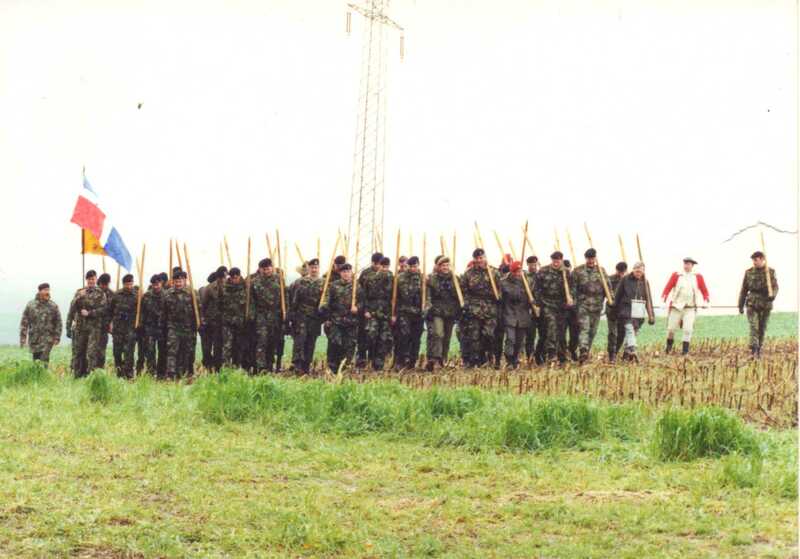 The exercise took place after the end of the first Gulf War and before the Balkan conflict. It shows what can be done to bring a historic battle to life given time and resources. The study covered two battles of the Seven Years war wehich took place close to British Army Garrison Towns. Hastenbeck 1757 is an infrequently studied or remembered battle that took place south of Hameln. 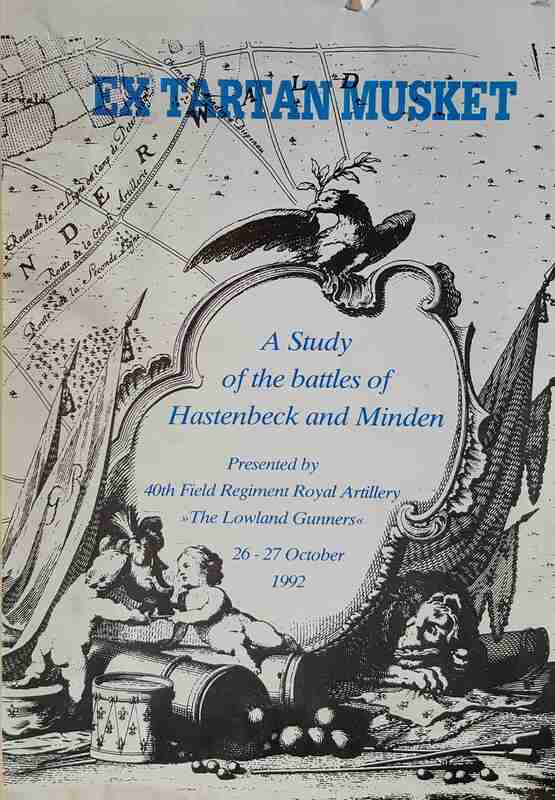 Minden August 1759 has a place in British military heritage for the remarkable role of the british infantry in defeating the French Cavalry, and for the court martial of one British commander for cowardice. The Battlefield Guide was Frank Baldwin with Dr Christopher Duffy as a subject expert, revered ion Germany for his biography of Frederick the Great. It is harder to understand pre twentieth century battlefields dues to the unfamiliarity with the weapons, tactics and ethos of the time. A range of techniques were used to help participants understand. 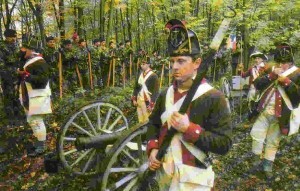 A team of re-enactors with infantry weapons and a cannon. Half a dozen volunteers from the Sennelager Polo Club to illustrate the nature of cavalryy. 100 re painted figure 11 targets lined up to represent an infantry battalion, which were visible as a “thin red line” at 1,500 metres. Large screens erected at key points to label battlefield features. 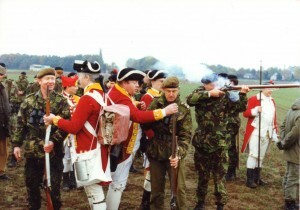 80 staves,a flag and drill instructor supported by a fife and drum to allow participants to re-enact an assault using the tactics of the time. Battlefield manouvres demonstrated by colour parties and left and rright markets. Support from local historians identifying the archaeological evidence of these battles. Support from local black powder enthusiasts to demonstrate the weapons of the time. 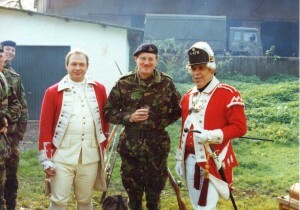 The use of re-enactors and offered some real insights about the nature of warfare at the time. It was surprising how effective slow time foot drill was in maintaining order, spacing and alignment over rough terrain and steep hills. If you want to find out more about planning exercises to Pre C20th battlefields or the ideas used in this exercise, please drop me a line at enquiries@staffrideservices.com or call the office +44 207 387 6620 or my mobile +44 781 317 9668.